One man knew the perfect way to ask to a "Gilmore Girls" fan to be his bride would be to take her to the very spot where Lorelai Gilmore became a bride. 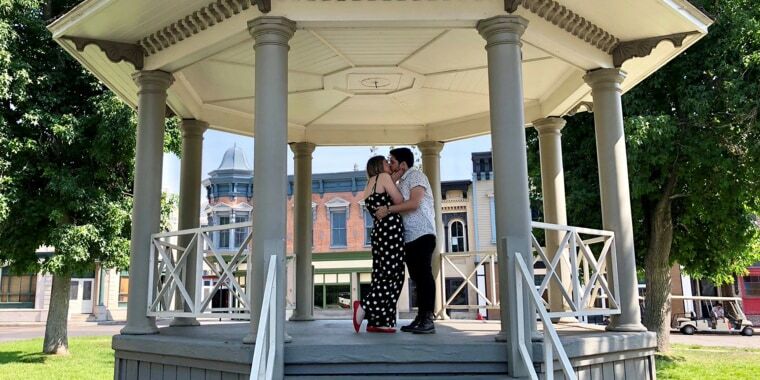 When Sebastian Wright decided to pop the question to his "Gilmore Girls"-loving girlfriend, Molly Larimer, he did it in Stars Hollow style — and that doesn't mean a rapid-fire proposal with a side of copious amounts of coffee. He actually took his 22-year-old bride-to-be to the fictional town and asked for her hand in marriage on the very spot Lorelai and Luke said their "I dos." After nearly four years of dating, Wright, 23, was certain he'd picked the perfect location. After all, Larimer had not only watched the series since they've been together — several times, in fact — he'd also noticed her fascination with the gazebo at the center of the show. "She would talk about that gazebo every time we'd drive anywhere and see a gazebo," he told TODAY. "She's like, 'Look! It's a gazebo.'" So after learning it was possible to take a tour of the made-for-TV town at Warner Bros. Studios, Wright put his plan in motion with the help of friends and family — who tagged along on the tour — and a manager from the lot who arranged to have the couple do an "improv scene" at the hallowed gazebo. Everyone but Larimer knew what the scene would really be. "(I had) no idea," Larimer told TODAY. "No one gave me any hints." That is, except for her now-fiance, who clued her into what was really going on once they stepped into the famous structure and he got down on one knee. After a brief shriek of shock, she said yes! And then they shared a small-screen worthy kiss — just like another couple. "I’m so lucky and so happy to spend forever with him," Larimer wrote alongside a video of the proposal she shared on Twitter. And they're both lucky they didn't have to wait as long as Luke and Lorelai — who were on-again, off-again for several season before finally settling down together in the "Gilmore Girls" revival.